Most 2x4 walls are built using 2x4 studs and wall plates, and nailed together using 16d sinker nails. The standard design for wall plates is two top plates and one bottom plate, any wall plate or stud that will be in contact with concrete should be pressure treated to prevent moisture damage. 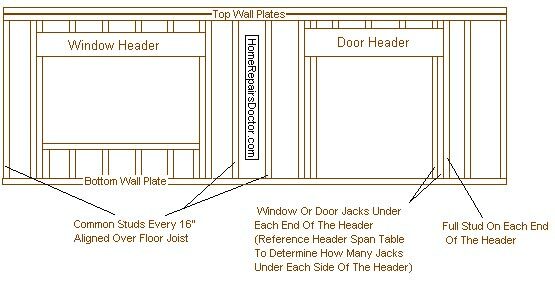 If the ceiling in the room is 8', the standard stud length is 92-5/8" allowing for one bottom plate and two top plates making the actual wall height 8'1-1/8". If the ceiling is 9', the standard stud length is 104-5/8" making the actual wall height 9'1-1/8". When laying out for the common studs, they should be stacked directly over top of the floor joist, allowing for the plumbing and heating connections. Rough window openings should allow for a 1/2" expansion gap for clearance, to figure out the rough opening for windows add one inch to the width and one inch to the height of the actual window this would be your rough opening. The standard header height for a window is 83" off the floor. When determining what the rough opening for a exterior doorway should be you add one inch to the overall width of the door being installed, allowing for a 1/2" on each side of the door. That measurement would be your overall width for the rough opening. To get the height of the rough opening you add a 1/2" to the height of the door being installed for above the door. It is the same for interior doors you would add a 1/2" to the height and add 1" to the width of the doors being installed. Standard headers for doors and windows are built using any where from 2x6 - 2x12 grade #2spf or better lumber, cases where there is more weight bearing over the area microlam beams are used to carry the load. Window and door openings have jacks on each side of the opening to support the header. Openings less than 4' require only one jack on each side of the opening, openings larger than 4' require two jacks on each side.